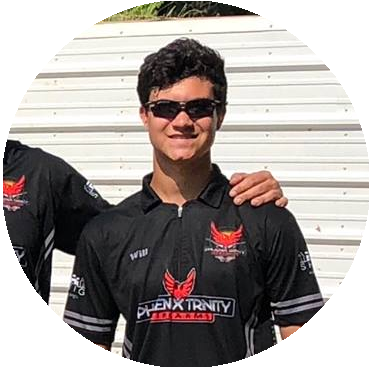 Will has been on the phoenix trinity team for one year. He’s been shooting USPSA for 5 years but started shooting professionally when he joined the Phoenix Trinity team. He shoots a lot of local matches and has shot a good amount of major matches over the past couple years. Over the course of 5 years he’s shot about 200 matches. Currently Will shoots in the Open division because it’s the most enjoyable class for him. He loves the fast pace aspect of it. Currently he’s a Master class Open shooter. His favorite match is the Mississippi classic. He’s only shot that match once and he shot it this year with the team. That was some of the best fun he’s had shooting. Will’s current setup is an Axiom Ethos. It’s a highly tuned 9mm open gun built on a Phoenix trinity frame, slide, grip and safeties with a C-more rts2 8moa red dot. He also runs MBX magazines and a double alpha accademy belt, holster and mag pouches. He likes to spend his free time off-roading, fishing, camping and just having a good time with his friends.